Since when are mathematical summer schools taking place in the “Institut du Radium”? i wrote “to the school SITE”, meaning that the school took place at the same site as the Musee Curie/Institut Radium, in particular I didnt want to say that it was taking place in the same building. The building where the summer school took place – the Institut Henri Poincare – is right opposite to the Musee Curie. I forgot to take a picture of the access of the Institut Henri Poincare, that’s why I choose the access of the Institut Radium. Apart from that “Institut Radium” looks kind of more spectacular. 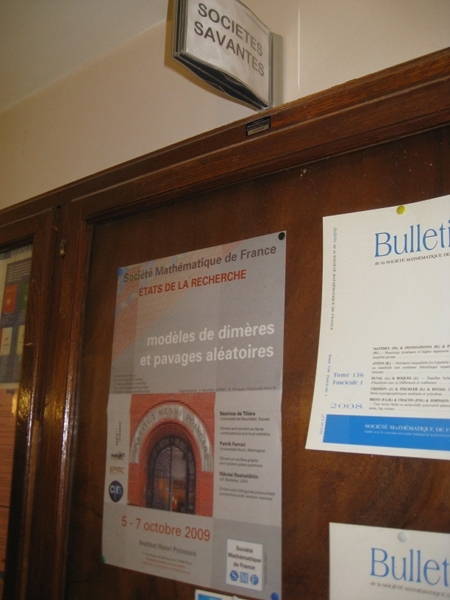 I have only a picture from the access of the Institut Poincare which was on a conference announcement attached to a board in the Institut. But it is out of focus.